Big Green Egg Covers Protect Your Big Green Egg Investment! Home / Posts / Big Green Egg Covers Protect your Big Green Egg Investment! Upon purchase of a Big Green Egg, you have officially welcomed a new member to your family. Mom, Dad, 2 kids, a dog and a Big Green Egg: the definition of the true American Family. Only Big Green Egg owners understand the significance of bringing family and friends together with delicious meals cooked on their Big Green Egg. You can be proud that you are providing the ones you love with a quality meal unattainable with conventional grills, ovens or smokers. A man changes once he owns his very own Big Green Egg; use one and you will begin to understand. As Big Green Egg owners we need to be sure that our investment is well taken care of and protected so it will be enjoyed for many generations to come. This can be a difficult challenge in many parts of the country with poor weather conditions. With constant wind, rain, snow and sun attempting to put your Big Green Egg out of commission you need a reliable cover to achieve piece of mind that your Big Green Egg is safe and sound. With a few different options to choose from, it is important that the cover you select fulfills your needs as a Big Green Egg owner. Attempting to save a buck with a cut rate generic cover will not provide the same protection that an all weather premium ventilated cover made with a heavy duty material will. Big Green Egg covers will ensure that harmful UV rays, high humidity and snow storms won’t prevent you from using your Big Green Egg all year long. Need a cover for an Egg in a nest? 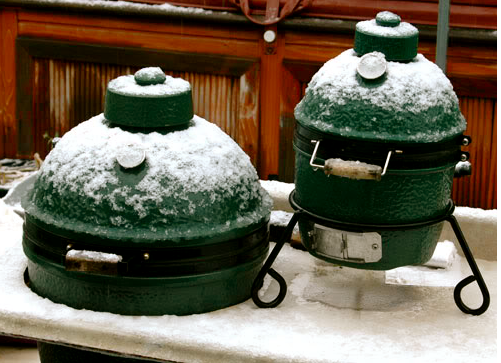 Choose a Big Green Egg Premium Nest Cover tailored to your Egg size. Need a cover for an Egg in a cyprus table? Choose a Big Green Egg Premium Table Cover just right for your Egg. Need a cover for an Egg in an outdoor kitchen? Choose a Big Green Egg Premium Dome Cover specially designed for your Egg. Reasons to buy a cover. Prevent fading of the ceramic. Prevent the lid from freezing to the base when wetted by snow and freezing temperatures. Prevent damage to the seal between the head and the base. Prevent rust on metal hardware. Protect your wood table from water stains. Protect your wood table from fading. Protect cookware and tools left outside on your table. Remove snow quick and easy by removing the cover. Next post: Dizzy Pig Pineapple Head Aloha Burger!